"American Berserk" is an exhibition featuring the work of New York-based artist Valerie Hegarty. The show runs November 2 - December 20, 2017 at the University of Michigan Institute for the Humanities gallery at 202 S. Thayer, Ann Arbor, MI. Everything in Valerie Hegarty’s exhibition “Bloom and Gloom” at Burning in Water looks as if it is broken, dead or falling apart. 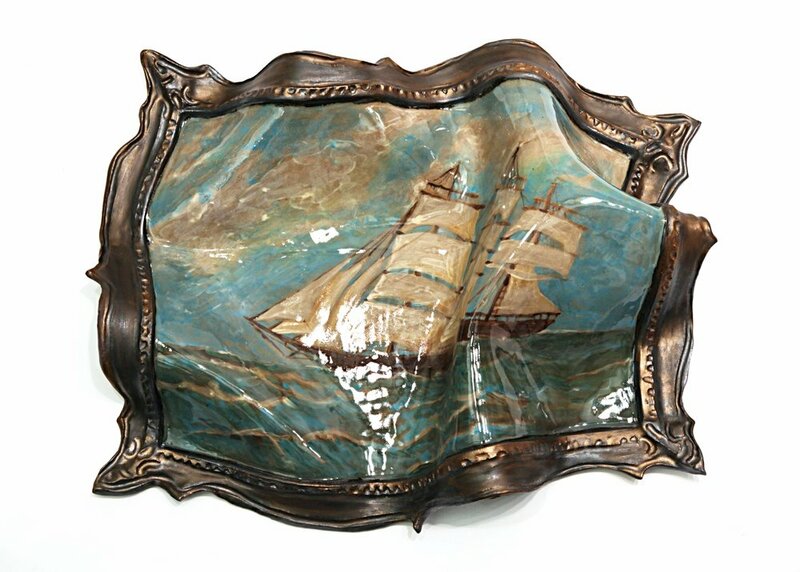 A ceramic relief of a rosebush is cracked all over; the sculptures are pots filled with drooping flowers; and wall works made from paper and paint (among other materials) have peeled, crumbled and dripped. In some cases, piles of scraps have pooled on the floor below, seeming evidence of the fatal conspiring of the passage of time and human neglect. All these pieces were meticulously crafted by Ms. Hegarty, who has made an art practice of exploring the imaginative possibilities of decay. In the past, she has used her techniques to challenge the romantic legacy of whitewashed American history; here, the subject matter is more personal. The paper works represent parts of walls from her life, including one in her mother’s bedroom. 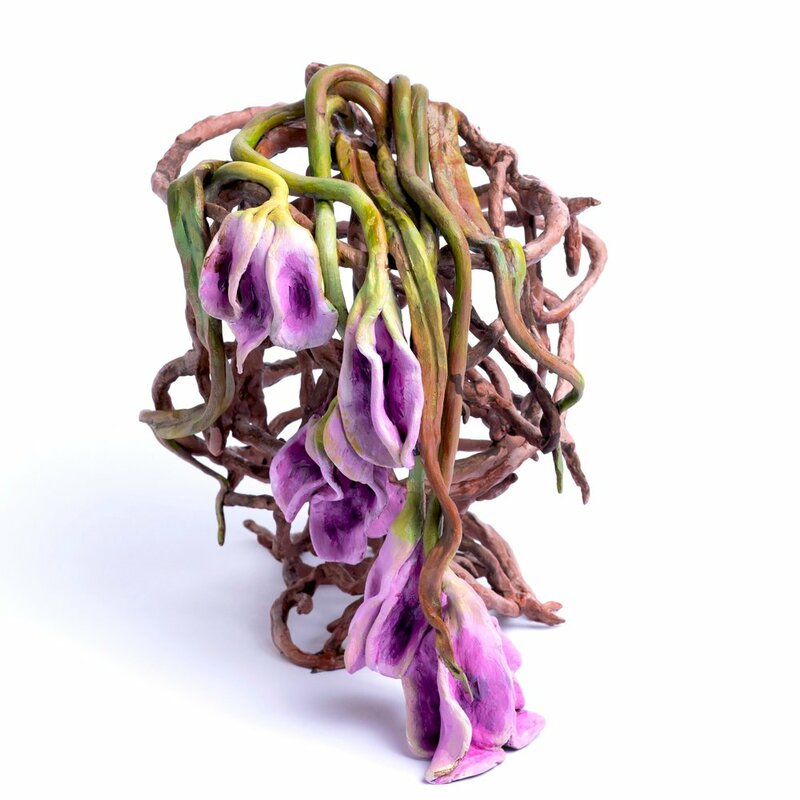 The ceramic flowers are mostly tulips in reference to 17th-century Dutch vanitas paintings, but it’s easy to imagine them as houseplants that couldn’t survive the harshness of life in New York City. “Bloom and Gloom” is a dark show. Ms. Hegarty’s rendering of her bathroom walls with the rot so fully in command offers an intimately dystopian vision. 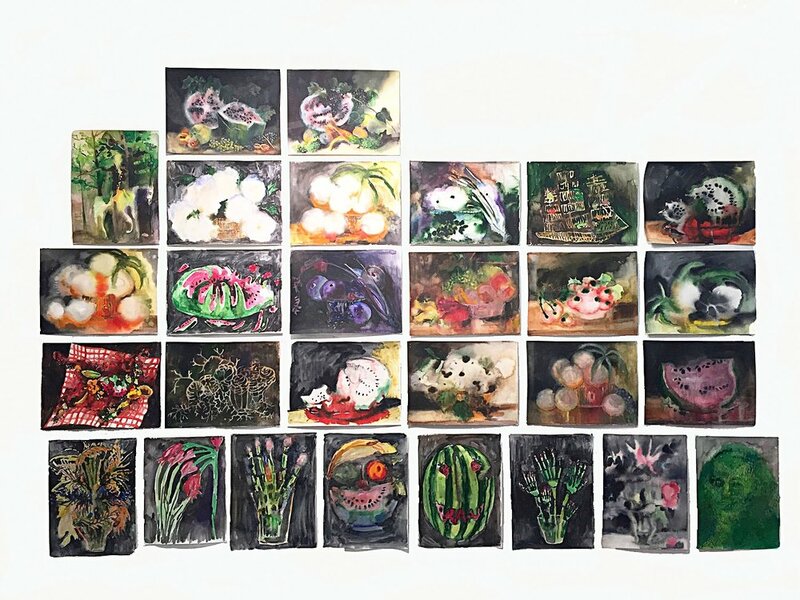 Yet the artworks also contain beauty — as in the gray-black luster that coats “Charred Tulips” (all works are from 2018) — and inspire wonder, as at the edges of “Boarded Up Window, Brooklyn,” where Ms. Hegarty has painstakingly blended an illusory derelict wall with the gallery’s pristine one. The care she takes with her acts of creation suggests a distinct approach to rot: Rather than fear it, she considers what it can teach us about ourselves. Founder Barry T. Malin and San Francisco Director Anna Hygelund launched their new outlet at Minnesota Street Project (1275 Minnesota St., S.F. www.burninginwater.net) this week with a seductively downbeat exhibition by Brooklyn artist Valerie Hegarty. “American Berserk,” which will run through July 18, might be called Bukowskian in its dark humor, though the works have a decidedly surrealist bent. Hegarty has built a regional (that is, New York) reputation with over-the-top sculptural objects that look like 19th century American paintings come to life. Birds fly, trees branch off the canvas surface and into the gallery; pictured forest fires burn their frames to ash. The West Coast outlet of a young New York gallery debuts with this engaging exhibition. Hegarty’s ceramic sculpture displays a loopy humor, often with reference to American history. Strange watermelon slices morph into gruesome smiles, suggesting the diseased association of the fruit with race and slavery. A sailing ship seems made of finger bones, the skeletal remains of a history of conquest. Through July 18. Contemporary art has been experiencing a ceramics renaissance for several years now, though its full breadth remains underexplored by galleries and museums. “Clay Today,” a new exhibition at the Hole, provides a welcome, if not rigorous, introduction to the utterly creative and clever ways that artists are using this material. The most compelling of such works hang on the wall: Valerie Hegarty, Thomas Mailaender and Jesse Edwards have turned ceramics into imitations of paintings, photographs and TV sets, with the objects getting flatter as the illusionistic space deepens. Rotting, wounded, smiling--watermelons in Valerie Hegarty's latest exhibition of paintings and sculptures--are depicted as sentient objects: carnal, threatening. 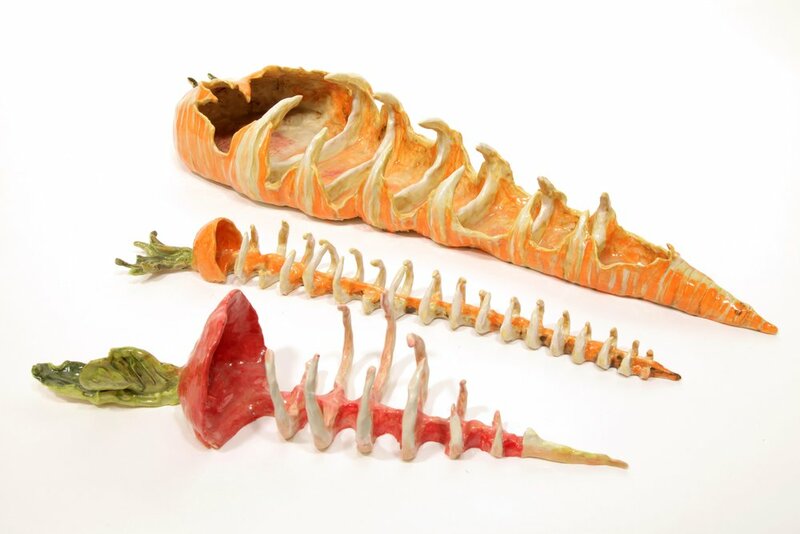 Several wedges of the fruit, done in ceramics, rest on a plinth, their pink flesh resembling gums and growing teeth, tongues, ribs, stalagmites, barnacles. I am always interested in talking about transformation," Hegarty said one recent afternoon in her studio in midtown Manhattan, surrounded by a sinister set of anthropomorphic fruits-- tooth-filled watermelons rinds, spinal carrot carcasses and some Arcimboldo-style faces. The pieces are a morbid answer to kitschy centerpieces of yesteryear, now robbed of their evergreen freshness. 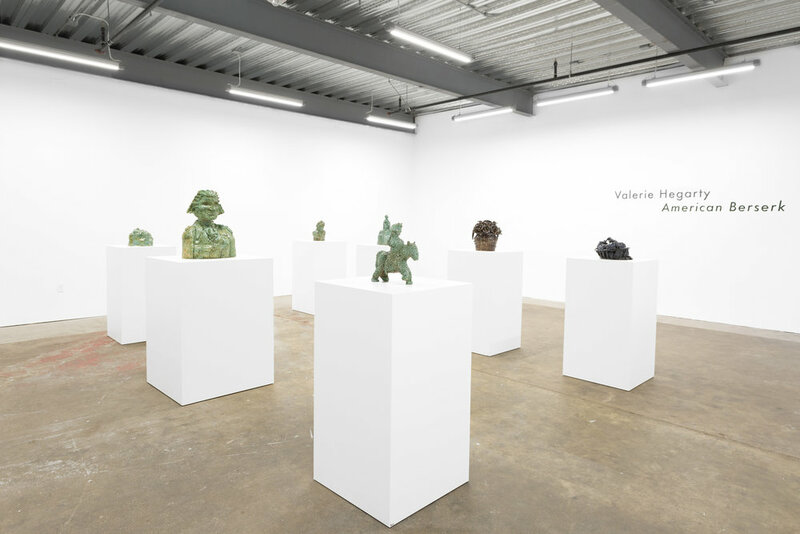 [Art Basel Miami] features works by several artists working in the same vein...that is, making figurative ceramic work that plays with scale and tone, or that uses the handcrafted medium to imbue typically inanimate objects with inner life. 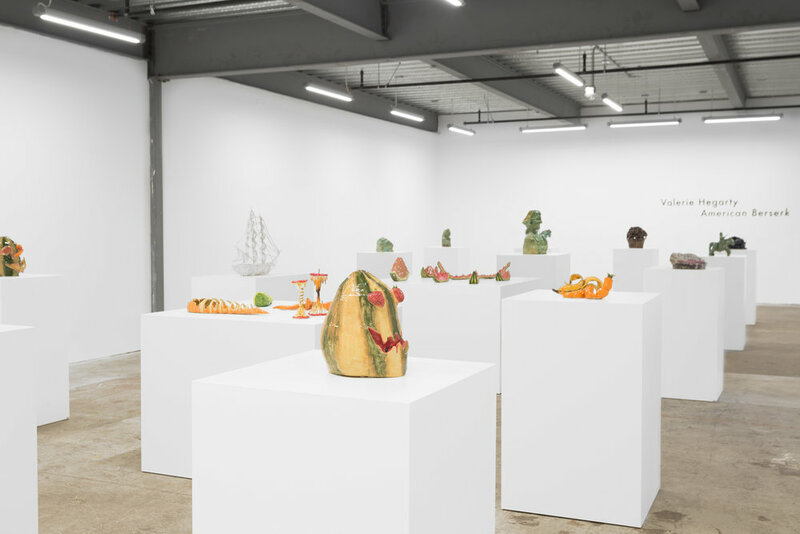 [A] shining example of this approach are the playful food sculptures by Valerie Hegarty that are on view in Miami gallery Locust Projects' booth. [Hegarty's] work is topical, as it is informed by the 'current turbulent state of our country while also excavating from America's past.' What we're seeing here couldn't be described as decay, as such, but her work seems to have a theme of the gooey-ness of information, of shared knowledge. We live in a post-fact society and consensus validation is gospel. That, of course, leads to strange distortions of the truth--things that resemble fact, but are wholly alien to reality. The centerpiece of the exhibition is a sculpture by artist Valerie Hegarty, Return to the Catskills. An amalgamation of canvas, paint and moss, the piece is nature-art hybridity depicting a moss-covered tree (and a small woodpecker) devouring a painting. Malin says that the piece "directly attacks the idea of the landscape that exists outside the ravages of time and the impact of society." -Valerie Hegarty’s multimedia work Fallen Bierstadt, a modern interpretation of Albert Bierstadt’s Bridal Veil Falls, Yosemite (1871-73), is currently on view alongside the original in the exhibition Nature's Nation at the Peabody Essex Museum in Salem, MA. The show runs from February 2 to May 5, 2019, and will travel to the Crystal Bridges Museum of American Art in Bentonville, AR (May 25 - September 9, 2019). Nature's Nation opened at the Princeton University Art Museum, running from October 13, 2018 to January 6, 2019. -Works by Valerie Hegarty were exhibited in Black Mirror: Art as Social Satire at the Saatchi Gallery in London. September 28, 2018 - February 23, 2019. - American Berserk travelled to San Francisco and inaugurated Burning in Water's second location. April 24 - July 18, 2018. -Nomadic Murals at the Boca Raton Museum of Art, Florida included work by Valerie Hegarty. April 21 - October 21, 2018. - Mother Gallery in Beacon, NY hosted a group show, The Cruellest Month, with work by Valerie Hegarty. April 14 - June 30, 2018. -The Hole gallery in New York City included two works by Valerie Hegarty in their well-received ceramics show Clay Today. April 10 - June 6, 2018. 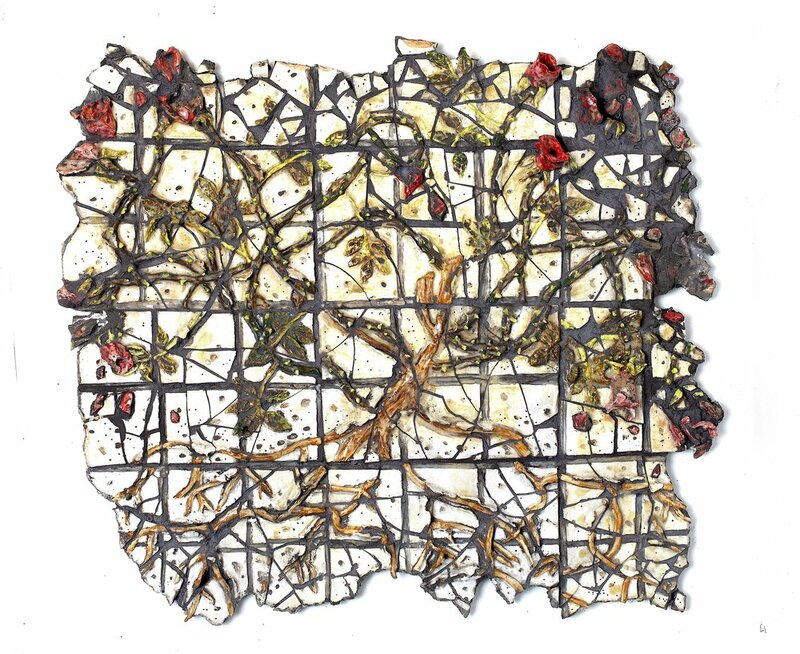 -Dorsky Gallery in Long Island City, NY, hosted Molding/Mark Making, including new work by Valerie Hegarty. January 21 - March 25, 2018. -Valerie Hegarty's work was featured in Sabbath: The 2017 Dorothy Saxe Invitational at San Francisco's Contemporary Jewish Museum. November 12, 2017 - February 25, 2018. - American Berserk was restaged at University of Michigan's Institute for the Humanities. November 2 - December 20, 2017. - Valerie Hegarty has been awarded a 2017 Fellowship from the New York Foundation for the Arts (NYFA). - The group exhibition Morph at Aysa Geisberg Gallery in New York featured recent work by Valerie Hegarty. June 22 - August 11, 2017. - The Portland Museum of Art recently acquired Valerie Hegarty's Warped Clipper Ship (2016), which is on long-term exhibition. Valerie Hegarty (b. 1967, Burlington, VT) is a Brooklyn-based artist whose work frequently employs critical engagement with American history and addresses themes of memory, place, and art historical legacy through painting, sculpture, and large-scale installations. Previous solo exhibitions include Nicelle Beauchene, NY; Marlborough Gallery, NY; Locust Projects, Miami; Museum 52, London; The Museum of Contemporary Art, Chicago; and Guild & Greyshkul, NY. She has completed public commissions for the High Line in NYC and the Brooklyn Museum. Hegarty's work is included in the permanent collections of the Brooklyn Museum, the Perez Art Museum Miami, the Saatchi Gallery, the New Britain Museum of American Art, the Portland Museum of Art, the Tang Museum, and the Wadsworth Atheneum. Hegarty received her MFA from the School of the Art Institute of Chicago and has received grants and awards from the Pollock Krasner Foundation, The New York Foundation for the Arts, the Rema Hort Mann Foundation, the Tiffany Foundation, and Campari NY. She has completed residences at LMCC, Marie Walsh Sharpe, PS 122, MacDowell, Yaddo, and Smack Mellon, and she served as the first Andrew W. Mellon Arts and the Common Good Artist-in-Residence at Drew University. Her works have been cited in numerous publications, including The New York Times, Artforum, Hyperallergic, American Art, Artnews, and ArtNet News. Valerie Hegarty, Ghost of History, 2016, stretcher, canvas, paper-mache, acrylic paint, foamcore and molding.